If you get chance to look back from where you came, it’s one of the most memorable views you will get from a road in England. Whilst climbing you probably won’t get chance to appreciate, so it’s worth coming down Wrynose Pass too. It’s a great natural amphitheatre. I’ve been up Wrynose pass on a couple of occasions, whilst visiting the Lake District. 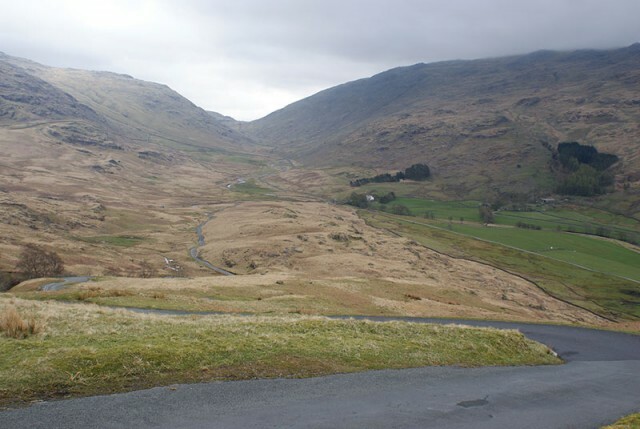 Often it involves going up Hardknott Pass as well. 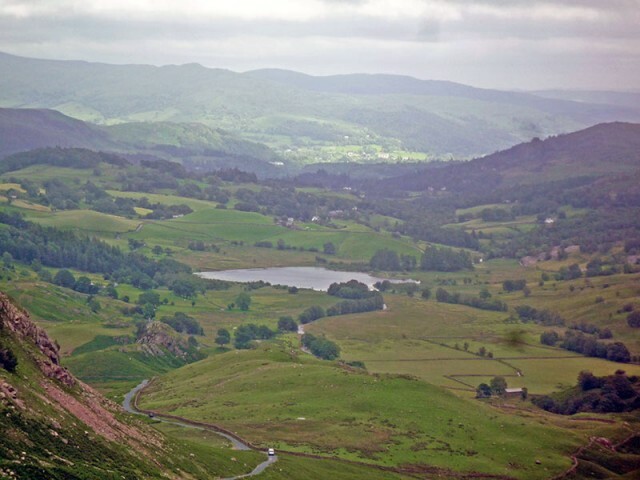 At the top of the Wrynose Pass is the Three Shire Stone, marking the meeting point of the historic counties of Cumberland, Lancashire and Westmorland. 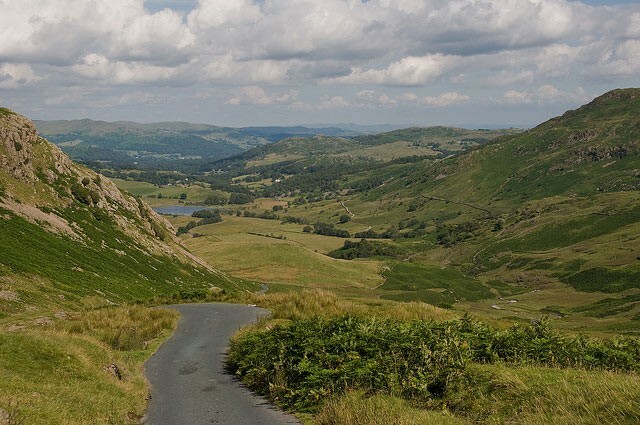 Coming from Ambleside, the road comes to a choice. 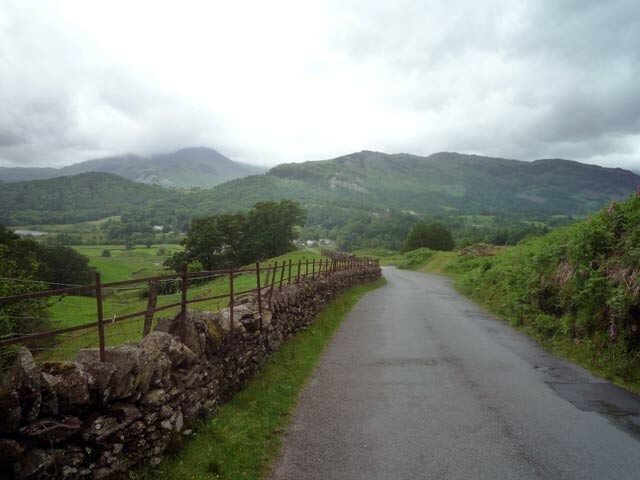 Straight on is Wrynose, to the right takes you over Langdale Chase. Last chance to take a trip to Wrynose. 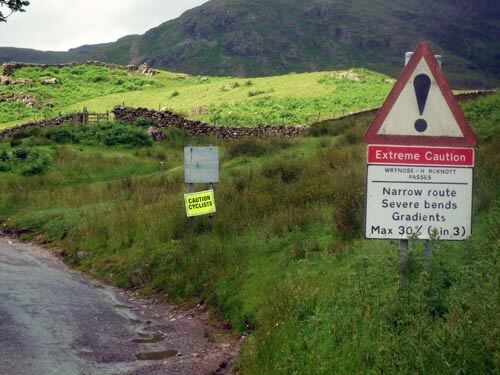 Extreme Caution! Severe bends! Always something to set the hill climbers heart thumping. Lots of water coming off the hills. A photo I took of famous view. Wrynose pass can be climbed from both directions. But from West to East it is not quite as tough. There isn’t as much climbing because the base of the climb is higher up. It is only towards the end of the climb, that it gets really steep, upwards of 20%. 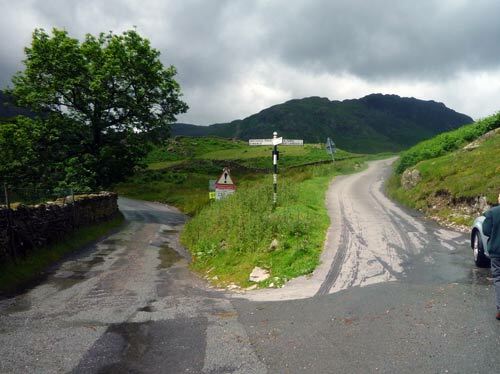 However, if you are climbing Wrynose this direction, you may have just come over Hardknott Pass so your legs will be pretty tired. 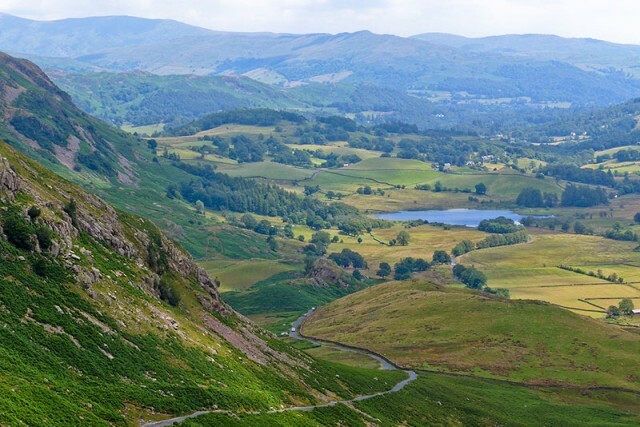 I cycled the Great Dun Fell last September, a super tough relentless slog of a climb how does this compare to The Wrynose and Hardknott Tejvan? I hope to get the chance to cycle them both next month (weather permitting) and also The Hartside & Chapel Fell. Great Dun Fell is harder than Wrynose because it is 3 * as long. But, Hardknott is really steep 30% steep, so it’s a whole new category of difficulty. P.S. good to see you competing in Surrey last Sunday for the Redhill TT event. Hope you get a chance to have a crack at Barhatch Lane soon, it’s quite similar to Whitedown but slightly longer and steeper. Tejvan, I know you have been national hill climb champion so congratulations for that but i am 12 years old and i love climbing, I have cycled the ventoux and alpe d huez and Dun fell ect and some other riders call me the climber off the future but i just want to know what you were doing at my age because all i see on strava on the big climbs is Tejvan Petinger got the KOM so i am just asking how you got be such a great climber. Cheers Tejvan! When I rode Great Dun Fell it was very tough but I managed it ok. Wrynose is the only hill I’ve ever had to stop for a rest on, although in my defence I was hungover! 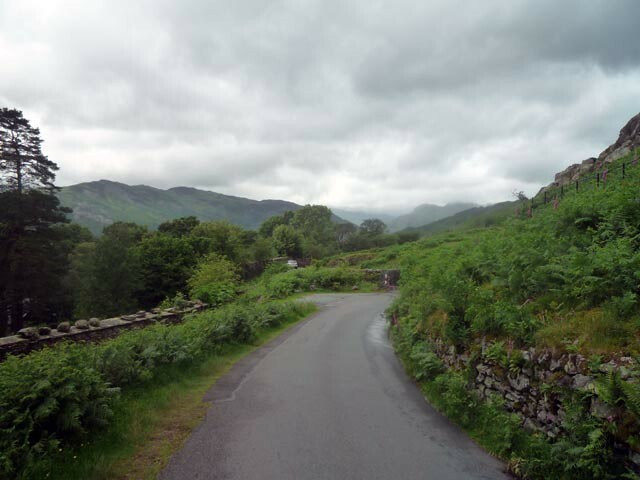 Hi Tejvan, just thought to say I finally cycled Hardknott from Eskdale onTuesday, what a magnificent climb. 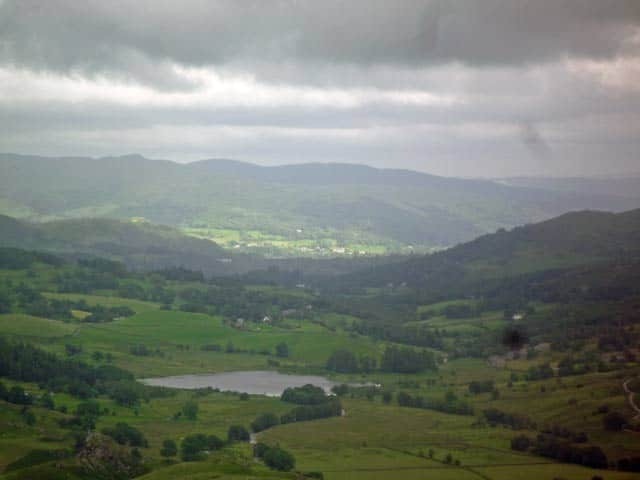 If you’re up in The Lakes again.Try a route from Coniston to Broughton in Furness, take the right to Hummer Lane 1.9 km average 8% (the view from the moor at the top acoss to Morcambe Bay is wonderful) Kiln Bank Cross,Birker Fell and The Duddon Valley are all en route to Eskdale. Happy cycling. Look forward to giving wrynose and hardnott a crack.You riding great Dunn fell hill climb this year Tejvan? Tejvan, first of all congratulations for all your KOMs on strava and your national hill climb win in 2013. I am 12 years old and i love climbing i have done the ventoux alpe dhuez and dun Fell ect and i just want to know what you were doing at my age to be such a great climber and also what distances you were doing cheers Tejvan. Hi Archie, I don’t think I was riding a bike aged 12. Certainly not up big hills. https://cyclinguphill.com/my-early-bikes/ I perhaps started aged 14 – but very slowly with some old chaps in Otley CC. https://cyclinguphill.com/the-traditional-british-club-run/ – Archie – good luck with your cycling and climbing. Just remember, you have many years to come! Hi Tejvan, I just rode Wrynose and Hardnott, glad you agree it’s a hard climb as it took everything I had in my legs 🙂 Yellow warning rain made it “interesting”. 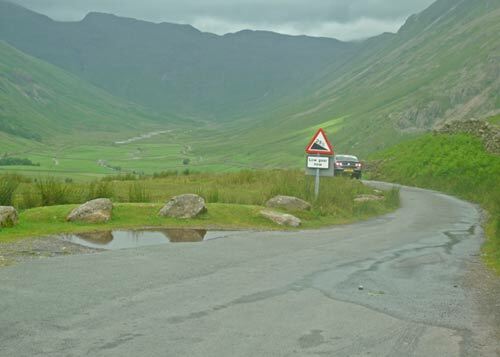 Birker Fell came next and it was another testing road, but stunning valley scenery at the end of it.